FRENCH COUNTRY DIARY - Bonjour! FRENCH COUNTRY DIARY 2018, OUR 30TH ANNIVERSARY EDITION! Interior hardcover of the 2018 FRENCH COUNTRY DIARY with a linen-textured Provençal fabric print from the archives of Les Olivades. Vintage-inspired French typography and period art enhance the pages of the 2019 French Country Diary. Linda Dannenberg has been producing the French Country Diary since 1989. She is the internationally known author of eleven books focusing on French lifestyle, design and cuisine. Among her titles is her latest style book, the lavishly illustrated French Country Kitchens, from the Clarkson Potter division of Random House. Other titles include New French Country; A Style and Source Book (2005), as well as the best-selling Pierre Deux series: Pierre Deux’s French Country, Pierre Deux’s Brittany, Pierre Deux’s Normandy; and Pierre Deux’s Paris Country, all from Clarkson Potter. She is also the author of the perennial classics, Paris Bistro Cooking and Paris Boulangerie-Pâtisserie (nominated for a Julia Child Cookbook of the Year award); and Ducasse: Flavors of France (nominated for a 1999 James Beard Award, and winner of the 1999 Versailles International Cookbook award). Her articles on cuisine, travel, and design have appeared in many publications, including Town & Country, Departures, House Beautiful, House & Garden, The Wine Spectator, Travel & Leisure, and The Los Angeles Times. A native of Boston, Dannenberg is a graduate of Connecticut College in New London, Connecticut. After a post-graduate year in Paris working as an assistant at an haute couture fabric house, she came to New York to join CBS News as researcher. She went on to work as a feature writer with Family Circle, and later became the founding Features Editor of Working Woman magazine. She is a frequent visitor to France, and has traveled extensively in Europe, researching and writing on regional style, crafts, and cuisines. She lives in New York. 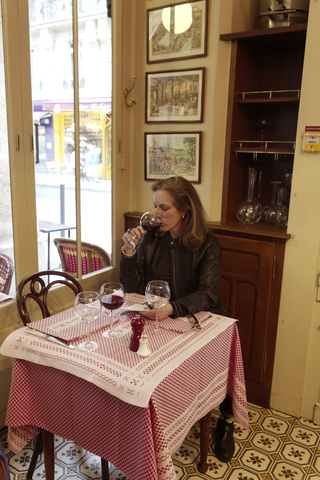 A working lunch in Paris at a favorite bistro, La Fontaine de Mars, near the Eiffel Tower.